Here’s something brand new: BookGorilla Author Pages! 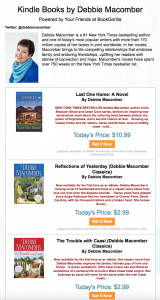 A screenshot of novelist Debbie Macomber’s BookGorilla Author Page. We never tire of working on the kinds of improvements that have made BookGorilla a big favorite with readers who want to find the best-ever deals on books they’ve been wanting to read, and it’s in that spirit that we share the news of a brand new beta feature on our website: BookGorilla Author Pages! Whether you arrive at one of these author pages from a link in your daily BookGorilla alert, as a result of a blog post like this one, a web search, or a tweet or other mention from an author whom you follow, we think you’ll find that BookGorilla Author Pages provide a great way to drill down on books by your favorite authors. And since we know that our readers cover the waterfront from bestsellers to indie discoveries across all genres, we’re committed to building a totally inclusive array of BookGorilla Author Pages from favorite indie authors like Suzanne Jenkins to hybrid stars like Noel Hynd to top-tier bestsellers like Harper Lee, Lee Child, and Mary Higgins Clark. As we grow from a hundred or so prototype pages to thousands and beyond over the coming weeks, we’ll also be introducing additional features like a follow or subscribe button for individual authors, title sorting by price, links to audiobook listings, and more … so please stay tuned!